This week’s events can be summed up in one word: Halloween. 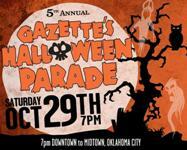 The 5th Annual Gazette Halloween Parade takes place October 29th. Beginning at 7 p.m. zombies, ghouls, and other creatures take over the streets of Bricktown in downtown Oklahoma City for one night only. Over 100 hundred floats and elaborate costuming and makeup are trademarks of the parade known informally as “Ghouls Gone Wild”. While The Flaming Lips are unable to participate this year, Zombie Walk OKC plans to live up to its award winning reputation, bringing together enough lifeless corpses to fill the void of the Lips’ absent skeleton army. The Oklahoma City Zoo hosts “Haunt the Zoo” for the 28th year in a row. From October 26th through the 31st, “Haunt the Zoo” aims to be a safe and fun place for children to trick or treat. Each night begins at the Zoo’s Global Plaza, where trick or treaters are greeted by mascot characters. Paths are decorated and lined with themed Halloween booths, and volunteers hand out candy. “Haunt the Zoo” happens from 6:30 to 8:30 nightly, rain or shine. The University of Oklahoma School of Music with the American Organ Institute presents “Nosferatu: A Symphony of Horror” on October 29th at 8 p.m. in the Catlett Music Center on the OU campus. John Schwandt adds a live sound track on organ to a screening of the silent film. “Nosferatu”, a German impressionist horror film from 1922, is loosely based on Bram Stoker’s “Dracula”. It has been the subject of film and literary criticism, and was remade most famously in 1979 by Werner Herzog starring Klaus Kinskey. The Oklahoma City University School of Music performs “Little Shop of Horrors” from October 28th through the 30th. The Opolis hosts its 6th Hallopolis October 28th featuring Stardeath and White Dwarfs. “High-Def Hitch”, a series of Alfred Hitchcock movies in high definition, lasts October 25th through the 30th at the Oklahoma City Museum of Art. More ideas, performances, and events for the Halloween weekend are on our calendar page.